Small but impressive this tractor pulls its weight and makes small work of even the biggest jobs. Ideal for small orchard work. The Mahindra 4025 does everything that it says it will. With 41 horsepower underneath its bonnet this tractor is simple to operate without unnecessary electronics. 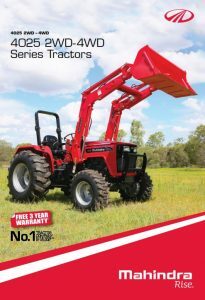 Available in both the 4WD and 2WD configuration, the Mahindra 4025 is one of the most rugged tractors in the field. This tractor is most commonly used in general orchard applications to tow agricultural trailers, slash and complete yard work. When fitted with an optional loader, the Mahindra 4025 is the complete package, becoming a good all-rounder. Boasting a 3 year warranty you can be sure that the Mahindra 4025 is set to perform.